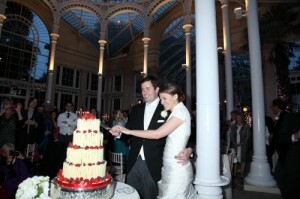 Lara and Jim got married in October at Syon Park in London which has the most stunning Victorian conservatory in which receptions are held. Lara had seen a number of chocolate cigarillo modern wedding cakes which she liked but she really wanted one where the cigarillos were unevenly shaped i.e no two exactly the same. We searched high and low for these but suppliers only sold the standard thin mass produced cigarillos so we decided to make our own! After a number of hours perfecting the tempering of the chocolate and the curling technique, we managed to produce perfect uneven cigarillos. 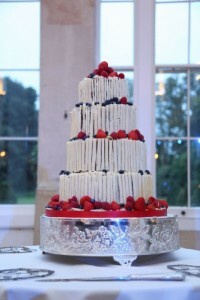 The resulting four tier white chocolate cigarillo wedding cake was spectacular as the pictures below show. We have now added this type of cake to our range and are pretty pleased with our efforts!